Auchentoshan distillery was established in 1823. Since then it has had six careful owners who have handed down its unique production process. The subtle aroma and flavour of its Spirit is achieved by its unique Triple Distillation process. The distillery has been extensively refurbished since its acquisition by Morrison Bowmore Distillers Ltd in 1984, although it still retains all its traditional production methods including its unique Triple Distillation process. Auchentoshan is appreciated by connoisseurs for its smooth flavour and by those new to malt whisky for its lightness and accessibility, this is one of only a few remaining Lowland malts. 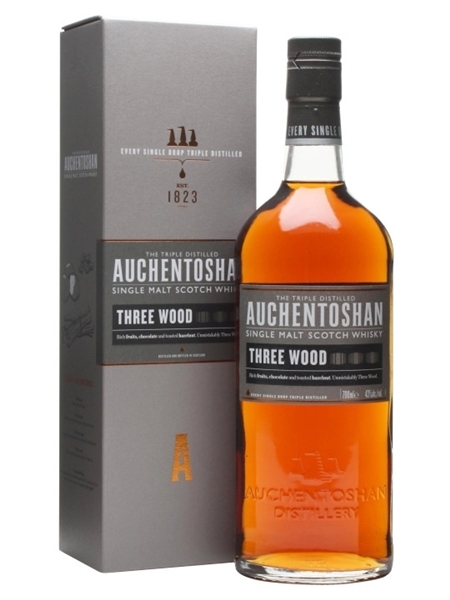 Matured in 3 different barrels (moving from American Bourbon - 10 yrs - to Spanish Oloroso Sherry for 1 year - and finally Pedro Ximenez Sherry casks for last year) Three Wood (~€55) is a non-peated, rich, complex whisky with incredible toffee and sherry oak flavours.